Claus Meyer, co-founder of Copenhagen's Noma, has just begun a pop-up bakery in Williamsburg. Every Saturday, Meyer's Bageri will open to sell Danish bread and baked goods. Meyer's Nordic food hall will launch in Grand Central this spring. Meyer's Bageri, 667 Driggs Ave., Brooklyn, NY 11211, 347-696-8400. Acme was a Cajun restaurant for years. And then without switching the name or the décor, it became an acclaimed Scandinavian-accented spot. Its latest incarnation is a Franco-Italian eatery serving everything from foie gras terrine to veal agnolotti. Acme, 9 Great Jones St., New York, NY 10012, 212-203-2121. Lilia is former A Voce chef Missy Robbins' Williamsburg culinary home. The restaurant, set in an erstwhile auto body shop, serves an array of creative and hearty pasta dishes as well as grilled meat and seafood plates. Lilia, 567 Union Ave., Brooklyn, NY 11211, 718-576-3095. The Lucky Bee is a farm-to-table pan-Asian eatery from former The Fat Radish sous chef Matty Bennett. The menu’s small plates and large plates include grilled octopus paired with pork belly and massaman curry of lamb shoulder. The Lucky Bee, 252 Broome St., New York, NY 10002, 917-262-0239. An offshoot of the Upper East Side's The Drunken Munkey, this "Curry Hill" eatery also serves Indian cuisine evoking the British Raj --- and Raj-themed cocktails to boot. The Royal Munkey, 438 Second Ave., New York, NY 10010, 646-863-2249. Syndicated is a new movie theater and restaurant in Bushwick, Brooklyn. The chef is Bret Macris (Los Angeles' Campanile) and the menu focuses on American comfort food. Syndicated, 40 Bogart St., Brooklyn, NY 11206, 718-386-3399. Chef/restaurateur Gray Kunz (Grayz, Cafe Gray) will open Salt & Char in Saratoga Springs. This modern steakhouse is set to debut in 2016. Kunz is also working on two additional culinary concepts for The Adelphi next door. The historic hotel is undergoing renovations and is scheduled to re-open in 2017. Salt & Char, 353 Broadway, Saratoga Springs, NY 12866, no phone. David Chang's first full-service restaurant in five years (and his debut in Chelsea), Momofuku Nishi serves a hybrid of Korean and Italian fare with some influences from the ingredients of Chinatown. Expect dishes such as cacio e pepe (with a chickpea paste instead of Parmesan) and a blending of the Korean dish su jae bi with Italian malfati pasta. No reservations taken for the time being. Momofuku Nishi, 232 Eighth Ave., New York, NY 10011, 646-518-1919. Brand new on the Upper East Side is Copper Kettle Kitchen, a restaurant serving well-executed American comfort fare complemented by craft cocktails. Menu options include chicken potpie, homemade fennel sausage, and Dijon-crusted rack of lamb. Copper Kettle Kitchen, 1471 Second Ave., New York, NY 10075, 212-744-1100. The Meatpacking District's Gansevoort Market will be moving in the spring to make way for the latest incarnation of Pastis. Fortunately, the food hall has already found a new home: 353 W. 14th St. There is no word yet on when the newly relocated market will be open after the move. Gansevoort Market, 52 Gansevoort St., New York, NY 10014, 212-242-1701. The new High Street on Hudson, a Philadelphia import, is now open for dinner. The restaurant, offering breakfast and lunch too, serves for the evening meal grilled squid, lamb tartare, and sunflower seed risotto, among other dishes. High Street on Hudson, 637 Hudson St., New York, NY 10014, 917-388-3944. Hill Country, the barbecue spot with locations in Flatiron and Brooklyn, is trying to help you cure the winter chills by offering for the month of February several variations on the theme of chili. Choose between spicy San Antonio-style, meaty bean-less or hearty chicken chili. 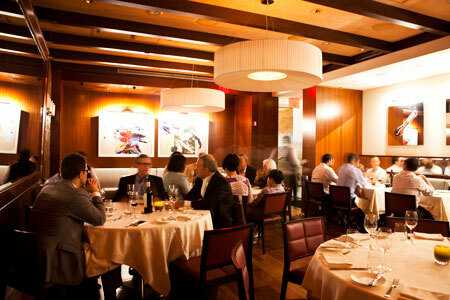 Hill Country, 30 W. 26th St., New York, NY 10010, 212-255-4544. Dominique Ansel, chef/owner of Dominique Ansel Bakery in New York, announced he'll be opening a location of Dominique Ansel Bakery in London. 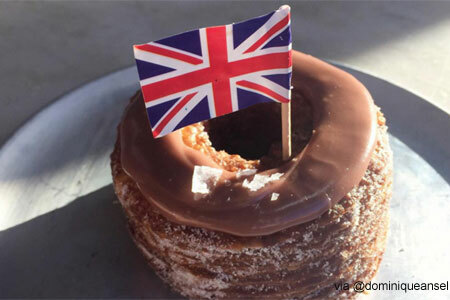 Patrons routinely line up for his invention the "cronut," a half croissant-half doughnut. The address has not yet been announced. After nearly nine decades of serving up steaks on W. 45th Street, legendary steakhouse Frankie & Johnnie's has moved. But have no fear: it is just a block away on W. 46th Street. Even better news: the restaurant is in a refurbished space that should make for a nice steak eating venue. Frankie & Johnnie's Steakhouse, 320 W. 46th St., New York, NY 10036, 212-997-9494. Restaurateur Gabe Stulman will be closing down his Greenwich Village Italian eatery, Perla, later this winter and moving it a bit further west. The restaurant will occupy a space on the corner of W. 10th and W. 4th Sts., just across the street from two of his other restaurants, Bar Sardine and Fedora, and a three-minute walk from his other two spots, Joseph Leonard and Jeffrey's Grocery. 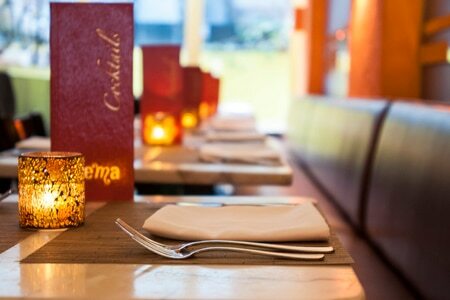 Perla, 24 Minetta Ln., New York, NY 10012, 212-933-1824. Chef Andrew Carmellini --- of Locanda Verde, The Dutch, Lafayette and Little Park, among other eateries --- will be crossing the East River this summer to open a yet-to-be-named restaurant in 21-story The William Vale Hotel when it flicks on its lights midway into 2016. Danny Bowien's Mission Chinese Food has begun offering a dim sum brunch every Friday and Saturday. The first weekend of the brunch, dishes were inconsistent, but hopefully the restaurant will be serving topnotch dim sum soon. Mission Chinese Food, 171 E. Broadway, New York, NY 10002, 212-529-8800. Talented pastry chef Gina DePalma, who had worked in the kitchen of Babbo, has passed away. She will be missed. Sirio Ristorante, opened by Sirio Maccioni of Le Cirque fame, closed on February 20, 2016, at its former home at The Pierre, A Taj Hotel, New York. The restaurant has now reopened within Le Cirque at One Beacon Court. Sirio Ristorante, The Pierre, A Taj Hotel, New York, 795 Fifth Ave., New York, NY 10065, no phone. The West Village outpost of Bushwick taqueria La Gringa has shut down. The casual Mexican eatery lasted just over a year. La Gringa Taqueria, 82 Christopher St., New York, NY 10014, no phone. Another piece of the former David Burke empire has fallen: David Burke Fishtail has caught its last fish and closed up. David Burke Fishtail, 135 E. 62nd St., New York, NY 10065, no phone. NoHo French restaurant Le Philosophe has shuttered. Le Philosophe, 55 Bond St., New York, NY 10012, no phone. January 24 was the last night for 20-year-old Greenwich Village restaurant Cafe Asean. The pan-Asian/Singaporean eatery was a favorite among locals. Chef Simpson Wong still runs the nearby Singaporean spot Chomp Chomp. Cafe Asean, 117 W. Tenth St., New York, NY 10011, no phone. Due to a rent increase, Chelsea’s Crema Restaurante has been forced to turn off its burners forever. Crema Restaurante, 111 W. 17th St., New York, NY 10011, no phone. Dinner theater Queen of the Night has performed its last act and served its final leg of lamb. Queen of the Night, Paramount Hotel, 235 W. 46th St., New York, NY 10036, no phone. Ocean Grill, a longtime restaurant on the Upper West Side, has gone belly up. There's no word yet what might move into the space. Ocean Grill, 384 Columbus Ave., New York, NY 10024, no phone. As chef John DeLucie's once sleek and chic restaurant empire crumbles, so goes the jewel in his crown: The Lion. The mecca for celebrities in the West Village has closed permanently. The Lion, 62 W. 9th St., New York, NY 10011, no phone. Michael White's SoHo steakhouse Costata has closed. The restaurant that served good steaks and an even better burger will be missed. Costata, 206 Spring St., New York, NY 10012, no phone. City Hall, which had been serving American fare for downtown eaters for 17 years, has closed. City Hall, 131 Duane St., New York, NY 10013, no phone. Open just two years, Bowery restaurant Bacchanal has shut down permanently. Bacchanal, 146 Bowery, New York, NY 10013, no phone. Union Square Cafe, Danny Meyer's once-pioneering restaurant, has closed and will re-open in a new location in Spring 2016. Union Square Cafe, 21 E. 16th St., New York, NY 10003, no phone.